It is an indisputable fact that when it comes to Arthurian era roleplaying, there is no greater roleplaying game than Pendragon – Chivalric Roleplaying in Arthur’s Britain. Originally published by Chaosium, Inc. in 1985, it was at the time a radical design, including as it does, personality traits and passions which influence each player character’s actions and attitudes. The most recent edition was published Nocturnal Media and even today, it remains the pre-eminent roleplaying game of its genre and a piece of classic roleplaying design. What is even more amazing about Pendragon – Chivalric Roleplaying in Arthur’s Britain is that its designer—Greg Stafford, also the creator of the Glorantha setting and many of its associated games—would tackle the genre a second time five years later. Although it would involve much the same cast of characters and much the same setting, this second roleplaying game approached Arthurian legend from a specific, but no less heroic or chivalric angle. This would be Prince Valiant: The Storytelling Game, based on Prince Valiant in the Days of King Arthur, the long running comic strip written and drawn by Hal Foster. Prince Valiant in the Days of King Arthur tells the story of Prince Valiant, a Nordic prince exiled to Arthurian Britain where his adventures see him become a squire and eventually a knight in the service of King Arthur. He will travel across the country and more, sailing to both Byzantium and Africa and as far away as America. The period for the setting is the fifth century, but not the historical fifth century. Rather it is an ahistorical setting, notably drawing very much upon the arms, armour, and castles of the Middle Ages for its look. That said, the comic maintains a strong sense of history and realism with less of an emphasis on the fantastic and the magical as found in other retellings of the Arthurian legend. Thus, whilst Merlin and Morgan le Fay both scheme and conspire, they do not rely as much upon magic as they do in other versions of the tales. All of this is reflected in Prince Valiant: The Storytelling Game, wherein the players take the role of knights aspiring to King Arthur’s Round Table—at least in the Basic Game, and whilst the Advanced Game offers more options in terms of characters possible, none of them have access to magic. It is possible acquire magical artefacts, such as Prince Valiant’s Singing Sword, but they are rare. In addition to offering more character options beyond knights, the Advanced Game provides the means for all of the players to take a turn as a Storyteller by interjecting small encounters and so gain Special Effects which can be used to influence the narrative. At its heart though, Prince Valiant: The Storytelling Game remains a very simple game mechanically, designed to be easy to learn and play. The simplicity of the mechanics in Prince Valiant: The Storytelling Game start with the fact that it does not use dice, but rather coins. Whenever a player wants his knight to undertake an action he throws a number of coins, typically equal to a knight’s Brawn or Presence, plus an appropriate skill as necessary. Head results on the coins count as successes, with two heads being required for an easy difficulty factor, three for a normal difficulty factor, four for a difficult difficulty factor, and five or more for a very difficult difficulty factor. A complete success is counted as being one where all of the coins come up heads and grants a player another success. So, if a player throws three coins and they all come up heads, then the result counts as four coins! So, for example, Sir Miles is riding through the forest when he comes upon some bandits. At the sight of the knight, they make a run for it and he gives chase. Sir Miles is making good progress when he spies a fallen log in his way. The Storyteller says that Sir Miles needs to jump the log to keep up with the bandits. From the character stats below, we can see that Sir Miles has a Brawn of 3 and a Riding of 2, which means that his player has five coins to throw. The Storyteller sets the difficulty factor at normal, which is three. Sir Miles’ player throws the coins and gets three heads. The knight is successful and can continue the chase. Opposed throws come down to whoever throws the most heads. This can be done quickly as one-off throws for Simple Opposed Resolution or as a series of opposed throws in extended contests for Extended Opposed Resolution. From one round to the next, the results are not only compared, but the difference between the winning and losing throw is subtracted—temporarily—from the number of coins the losing player must throw in the next round. Although this reduces the potential number of heads a player can throw, it also makes it slightly easier to throw a complete success, representing perhaps the desperation upon the part of the losing character and a chance that he might just get an unexpected edge on his opponent. Combat itself is not necessarily lethal, fights typically ending when a character’s or an NPC’s Brawn is reduced to zero and no more coins can be thrown by either player or Storyteller. Yet being violent, it is dangerous, and characters can be wounded, and deaths can and do occur, though really only to serve the needs of the story rather than an arbitrary throw of the coins. So, for example, having caught up with one of the bandits, Sir Miles dismounts and challenges the miscreant to give himself up. The Storyteller asks Miles’ player to make an opposed Presence plus Fellowship test versus the bandit’s Presence of 2. The Storyteller throws one head for the bandit, whilst Miles’ player throws no heads! The bandit yells, “I ain’t gonna!” and with a snarl rushes the knight with his simple wooden shield and axe in hand. Perhaps foolishly, Sir Miles is not wearing any armour—it is being strapped to the back of his horse—but he has his sword and shield in hand. The Storyteller will throw four coins for the bandit’s Brawn of 3 and Arms skill of 1. Miles’ player will throw coins for the knight’s Brawn of 3 and Arms skill of 2, plus another for his shield, for a total of six coins. In the first round, both throw two heads, Sir Miles getting his shield up just in time to block the bandit’s snarling attack. On the second round Sir Miles is unable to withstand the persistence of the bandit as the Storyteller throws three heads versus the player’s total of one. Subtracting the one from the three means that Sir Miles’ player will be throwing only three coins next turn. Fortunately, his luck is in, for Storyteller throws no heads for the bandit whereas Sir Miles’ player throws three heads—a complete success! This means that he has the equivalent of four successes. Since the Storyteller did not throw any heads for the bandit, he suffers four damage, reducing the number of coins the Storyteller can throw to zero! The bandit is out of the fight and Storyteller describes how Sir Miles determinedly knocks the bandit’s axe aside and forces him against tree, where he has no choice but to yield to the knight. Character generation itself is an easy process, as in the Basic Game, everyone plays knights. All a player has to do is give his knight a name, divide seven points between his Brawn (his physical attribute) and his Presence (intelligence, wisdom, perception, charisma, and so on), divide nine points between six skills, two of which have to be Arms and Riding. A knight also gets some possessions and a degree of Fame. Our sample knight is Sir Miles, who is, in fact, my character from our current Pendragon game, in which we are playing through The Pendragon Campaign. He is a very average knight, best noted for his incredible ability to compose songs and poetry. Hence this simplified version of him, he has a slightly higher Courtesie skill. Of the stats a character has, only Fame needs explanation. The easy answer is that this is the equivalent of Glory in Pendragon – Chivalric Roleplaying in Arthur’s Britain, a measure of how well known a knight or character is—whatever the deeds he has done for good or ill. That though, would be a glib answer, since it does not explain enough. Fame does indeed indicate how well known a knight is in Prince Valiant: The Storytelling Game, but it also measures two other factors. One is his progress and advancement. Each time a knight accumulated a thousand points of Fame, his player is awarded a point of skill. This can be used to increase an existing skill or be used to purchase a new one, the maximum skill a character can have being six. The other is his social standing—the knight with the highest Fame has precedence. For example, Prince Valiant himself only has a Fame of 47,000, whereas King Arthur has a Fame of 60,000, Sir Lancelot a Fame of 50,000, Sir Mordred a Fame of 37,000, and so on. Characters acquire Fame by participating in adventures and battles and succeeding in adventures and battles—preferably with witnesses. Typically, a hundred Fame is awarded for each, plus outstanding acts of bravery, nobility, good roleplay, and so on. The maximum Fame a knight can be awarded for an adventure is five hundred points. From the start, the Basic Game is designed as an introduction to roleplaying games, the author taking the time to explain not just how to play Prince Valiant: The Storytelling Game in terms of its mechanics, but also how to be an adventurer, what freedoms a player has in playing the game, and the goals for the players—including acting in character and how the game should proceed. Then it does the same for the Storyteller, examining her rights and responsibilities as well as learning how to be the Storyteller and how to make an adventure. As well as advice on Storyteller tricks such as visual and auditory aids and handling monsters and magic, it introduces ‘Special Effects’. These provide the Storyteller with automatic narrative effects or events rather than relying wholly on a throw of the coins. Some thirteen are listed, from TERRIFY and SAVE IN COMBAT to CONFUSE OPPONENT and AROUSE PASSIONS OF CROWD. These are intended to be used sparingly and it is advised that no more than three be used in any one adventure, these being attached to a specific NPC or NPCs. For example, a villain might have ESCAPE BONDS with which to free himself after being captured by the player characters, a fair maiden in distress could use ‘INSPIRE INDIVIDUAL TO GREATNESS’, or a fair maiden with ill intent might deploy INCITE LUST. The Advanced Game adds numerous character options beyond mere knights—Vikings, monks, merchants, hunters, peasants, and more, including thieves. That said, thieves are an option that require the Storyteller’s permission to play. The same goes for female adventurers, primarily because they present a much greater roleplaying challenge in what is a male dominated setting—both in terms of history and Hal Foster’s Prince Valiant in the Days of King Arthur. This does not mean that female characters are impossible or that as a game, Prince Valiant: The Storytelling Game is chauvinist. Along with new character options, the Advanced Game adds new or advanced skills. They include Alchemie, Bargaining, Disguise, Gaming, Stealth, and more. They also add Traits, psychological strengths and faults, which a newly created character can have up to three of. Traits remain hidden until they come into play and when they do, the Storyteller can reward a character with Fame if they used in a dramatic and interesting fashion which adds to the game. Traits can be targeted, such as Cruel to Horses (25), and they can be taken twice to become an obsession. So Sir Miles under the Advanced Rules appears as follows. The other example character is an ex-knight who has travelled widely and served the king. He has since retired and taken up the tonsure, preferring to study and aid rather than fight. In terms of rewards, the Advanced Game offers two other options beyond Fame. One is Gold Stars. These are rewarded for good roleplaying by the Storyteller, with the Gold Stars being affixed to the character’s Adventurer Card (or sheet). For each Gold Star awarded to his character, a player can throw an extra number of coins once per game. The other is Storyteller Certificates. These are earned by taking turns being the Storyteller. The Storyteller in charge remains the Chief Storyteller, but each player can interject at an appropriate time in the game and introduce a scene or episode—as an adventure is known—of his own, adding to the ongoing game. This can be an interruption, a flashback, and so on, either of the player’s devising or one of the very many at the back of Prince Valiant: The Storytelling Game. Ideally, these should be prepared ahead of time and ideally, the prospective Storyteller should have read through the roleplaying game’s rule and the guidelines on being a Storyteller. In return for acting as a Storyteller a player will earn himself a Storyteller Certificate. (They can also be awarded for exceptional roleplaying too.) At any time, the player can turn in his Storyteller Certificate to gain a Special Effect. This is a one-time narrative effect. Beyond adding Gold Stars and Storyteller Certificate, the Advanced Game offers an array of optional rules, such as being able to increase Brawn and Presence and adjusting Fame to allow for non-knightly characters who will never be as famous as knights. Prince Valiant: The Storytelling Game is rounded out with plenty of Episodes for Storytellers—both Chief Storyteller and Storytellers—to narrate, with several being variations upon a story. 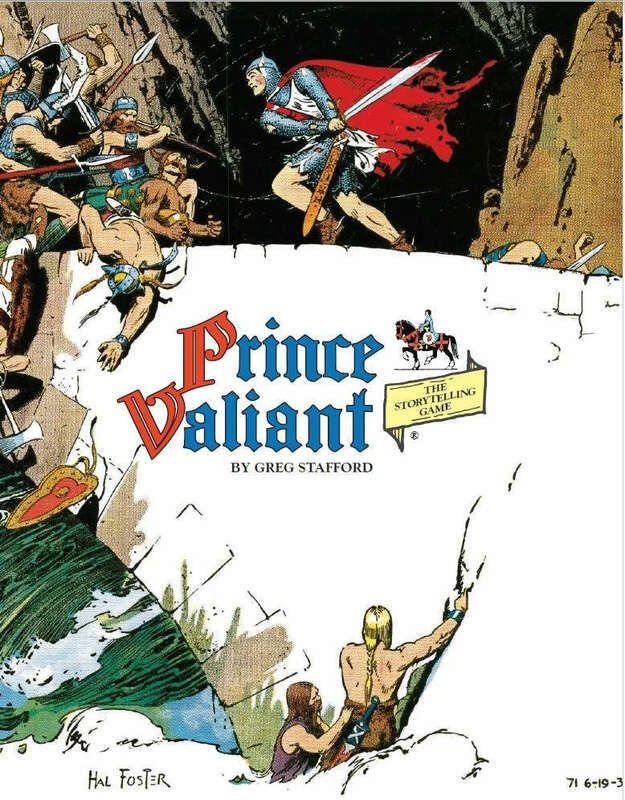 There are full write-ups of many of the characters from Prince Valiant in the Days of King Arthur, a description of both Prince Valiant’s world and his journeys, and an appreciation the world created by Hal Foster. Physically, Prince Valiant: The Storytelling Game is handsome hardback with a striking cover. It uses lots of Hal Foster’s terrific illustrations, the use of white, glossy paper showcasing his artistry and use of colour. It is also very well written, with lots of clear examples and dedicated advice for both player and Storyteller, especially about learning the game and what is expected of them. That said, the lack of an index is inexcusable, and it could have better edited in places. Unfortunately, back in 1989 when Prince Valiant: The Storytelling Game was first released, it paled in comparison to Pendragon – Chivalric Roleplaying in Arthur’s Britain. After all, its older brother had only been out five years and Prince Valiant: The Storytelling Game looked simplistic and lacked the support or depth. Indeed it would never receive any support beyond the core rules. Thirty years on and with the opportunity to re-examine the roleplaying game with the advent of the re-release, such concerns look misplaced. Certainly, Prince Valiant: The Storytelling Game is simplistic in terms of its mechanics, but that simplicity combines with two other factors to ameliorate those concerns. First in combination with the extensive advice to make Prince Valiant: The Storytelling Game a very well written and designed introductory roleplaying game. Second in combination with the shared narrative mechanics of Storyteller Certificates to make Prince Valiant: The Storytelling Game suddenly look like a very contemporary game design. A contemporary design with more than a nod to the narrative designs of the Indie roleplaying game movement. Yet this roleplaying game was released in 1989, so Prince Valiant: The Storytelling Game is arguably as radical and innovative as Pendragon – Chivalric Roleplaying in Arthur’s Britain was before it. As much as Prince Valiant: The Storytelling Game is Greg Stafford’s second approach to Arthurian, chivalric roleplaying, it is also his love letter to Hal Foster and Prince Valiant in the Days of King Arthur. It is a lovely treatment of the source and this is so much better reflected in the beautiful new presentation of the second edition of Prince Valiant: The Storytelling Game. This combined with the simplicity of the mechanics and what you have in Prince Valiant: The Storytelling Game is the perfect introduction to Arthurian roleplaying and Prince Valiant in the Days of King Arthur.